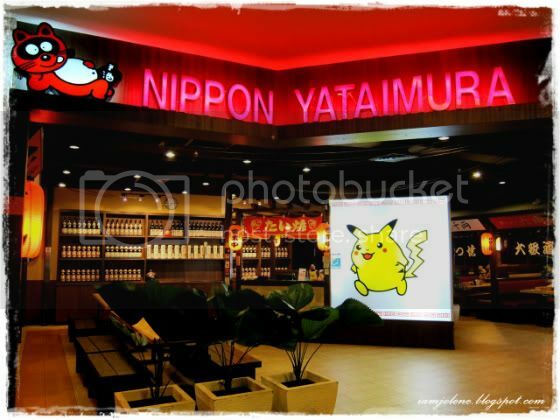 to the land of Tom Yum and Thai iced tea. Why am I blogging about Christmas which was exactly a month ago when it's still Chinese New Year now? Well, that is because Santa Jo or rather Santarina Jo is really late for Christmas gift giving/exchange with dear friends in 2011. Due to my London-Paris trip in December, I simply had no time to shop for Christmas gifts last year. On top of that, I stubbornly refused to join the mad Christmas rush in town and squeeze in with the last minute shopping crowd. Hence, I told my friends that I would be santarina only after I get back from my trip at the beginning of January. I got some gifts beforehand and also some in Paris. As for the rest of the gifts, I shopped for them online snug and comfy in my PJs, bedhead, nerdy glasses and all. Thank goodness for Little Little Gifts which saved me lots of hassle in getting the perfect last minute gifts for my friends. Some of you may remember my pleasant experience with them which I blogged about here. 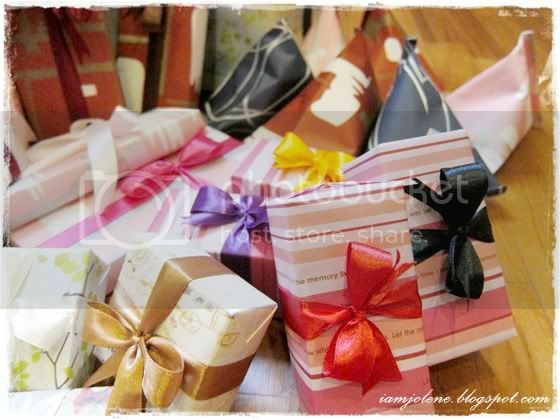 Free wrapping service was provided for all customers during the Christmas season and boy was I glad for that. If you've ever received presents from me, you would already be aware of my style of wrapping. I merely make use of "wrappers" at home existing in the form of glossy magazine paper and thick catalogue pages. I don't cut in straight lines and simply fold the excess "wrapper" in. I stick scotch tape hapzardly. When the wrapping is finally done, I stare at my masterpiece with great pride and choosing to believe that the shoddy piece of work is actually art. 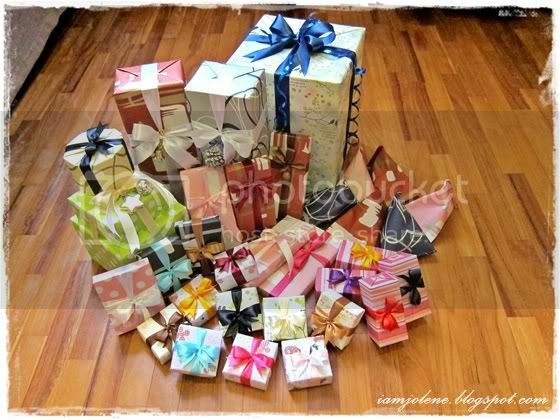 Hence, you could imagine how I squealed and gasped when I saw the gifts I bought all exquisitely wrapped and delivered to my doorstep! 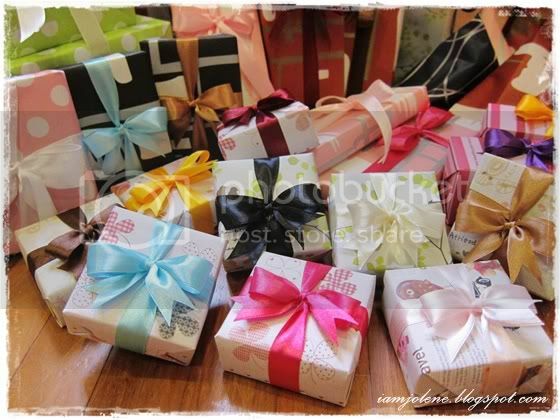 The ribbons are tied in such perfect little bows that I felt like passing my Tiffany boxes and white ribbons to the littles elves or whoever who did the wrapping at Little Little Gifts to tie them all up in perfect little white bows too. 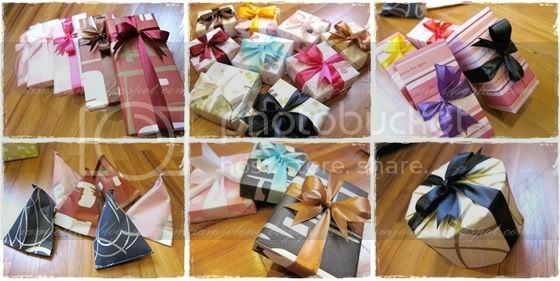 I like how even the same items of different colour or design are wrapped with different wrapper so as to differentiate them. Before delivery, a gift wrap detail email was sent so I could easily distinguish which gifts were beneath which wrappers. Really thoughtful of them! Special gift for my godson Jase. 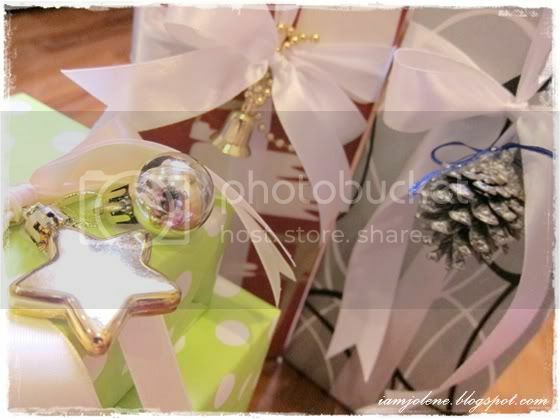 Seriously, I would never have thought of using Christmas ornaments as part of the wrapping. Ok or maybe it's just me being plain lazy and having a lack of creativity. 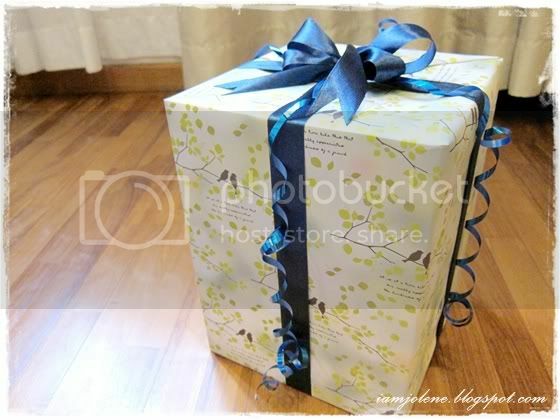 I've since met up with some groups of friends to exchange presents and some of them were really impressed by the wrapping, asking me excitedly if I wrapped them. 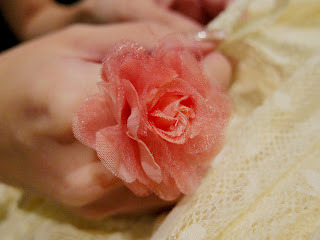 As for the rest of my friends, I would slowly find a common time in our schedule to meet them. 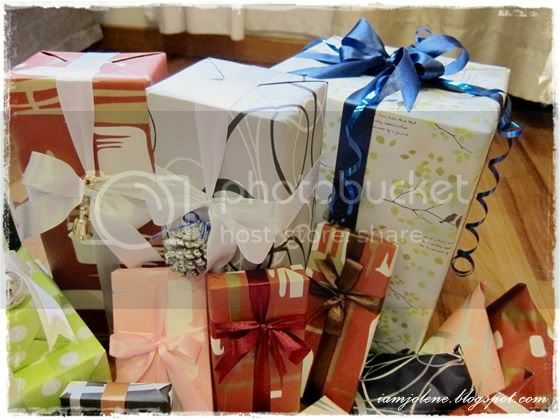 I'm sure they would be thrilled to receive gifts which are so beautifully wrapped. I know I'm really late in my Lunar New Year wishes but it's only Day 2 and there are 15 days of Chinese New Year, no? Using the Chinese pronunciation of dragon "long" as a pun, that means "Everyone Happy" when literally translated from Hokkien. I made an anigif of my family when we had a simple but delicious home-cooked lunch at my parents' place earlier in the afternoon. 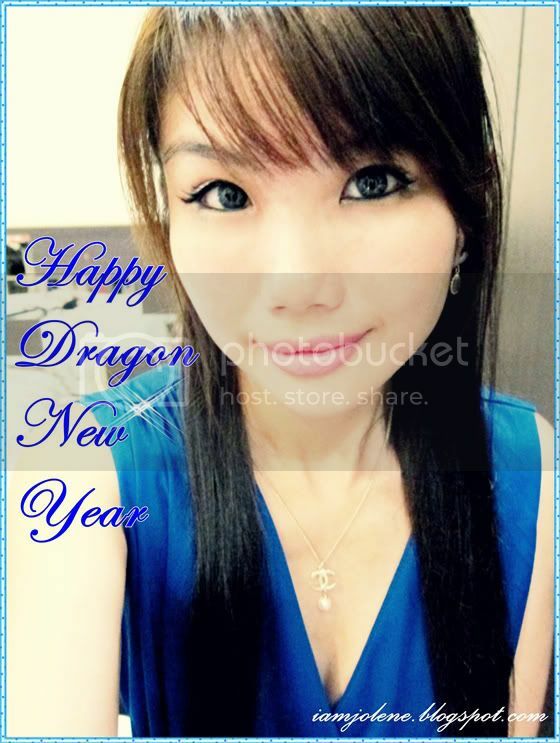 I hope all my Chinese readers enjoy themselves this new year. I'm never one who looks forward to CNY but I'll try to enjoy the whole process and it always didn't turn out too bad. "Once upon a silver moonbeam, a dreamy damsel drew at her desk: faeries, faeries and more faeries. There, she had lofty dreams about faeries. Since she loved all things beautiful, she dreamt of imbuing the people around her with beautiful things as well. 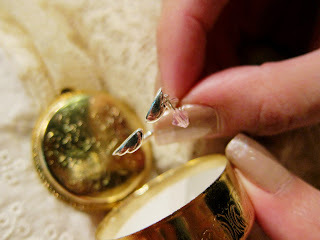 Adorning individuals with beautiful clothes and accessories to complement a beautiful heart was what she envisioned. Searching for other like-minded individuals to embark on this journey with her, the concept of Fleurfaerie was thus born. Many people don’t believe in faeries. See with your heart; they’re always there: dancing in the meadows, flitting about the flowers and hiding in the woods. If we open our minds, we might find tranquil pleasures softly caressing us. We exist with the angels that visit us on every sunbeam, and sit with the fairies who wait on every flower." 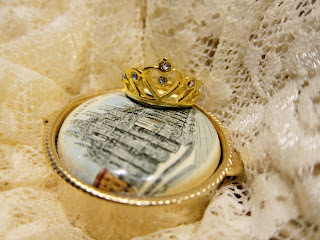 Take a sneak peak at some of the items available at fleurfaerie! 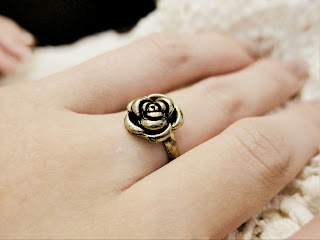 We are currently featuring accessories but do look out for more beautiful stuff from us in time to come! Who knows, there may be some beautiful things coming along your way! My dear hubby was studying (while playing World of Warcraft) the past two days for what he called a professional quiz for his job. Don't ask me how he studies while playing WoW. Apparently he did that during his university days and scored quite well, much to the annoyance of his peers. I glanced at his papers but could not decipher any logic from the overload of information in cryptic language. 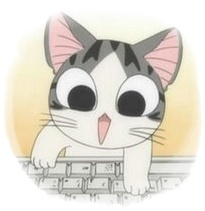 kh: This contains secret information. If you read it, I would have to kill you. jo: It's ok. I don't even understand a single thing except the word "Cessna". kh: Who knows, you might be a spy wife who married me for the sake of obtaining secret information. Jo gave a bewildered expression. jo: Ya right! A very lousy spy who passed driving not too long ago. kh: You are just pretending to be a stupid bimbo for the sake of spying. 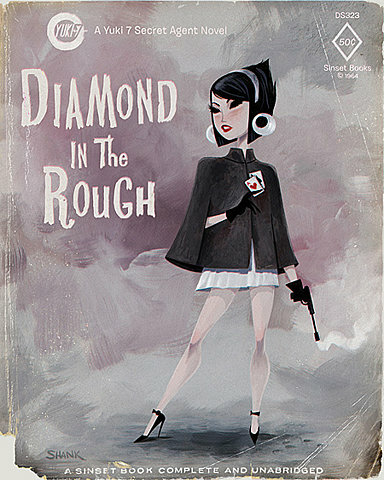 Yeah yeah, I'm a spy wife. And on most occasions, I perform stunts like this. But right now I'm nothing but a stupid bimbo. It's not that I've been upset or anything but there are some things which haven't been going my way. I have also been busy embarking on my project and met with some obstacles time and again. In addition, I also discovered two shocking revelation and though affected, I decided not to give a shiet about them anymore. So I was taking a break from working on my laptop and was viewing some photos. I really love this picture taken by hubby in Paris outside Arc de Triomphe. It was supposed to be an artistic shadow shot of the both of us. When he told me to turn my head and faced the side, I didn't expect myself to be in the shot. I thought it was quite cool my non-artistic-eye hubby did that. 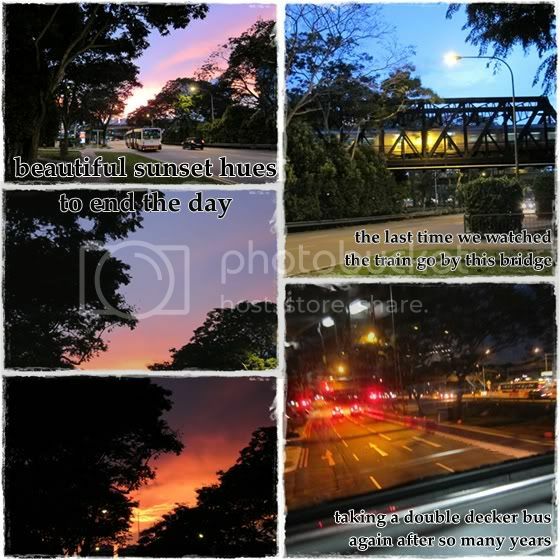 I've run out of edited pictures which I could use to craft my backdated entries from May last year and I don't think I would be able to update my blog with backdated posts for some time to come until I finished up till a certain part in my project. 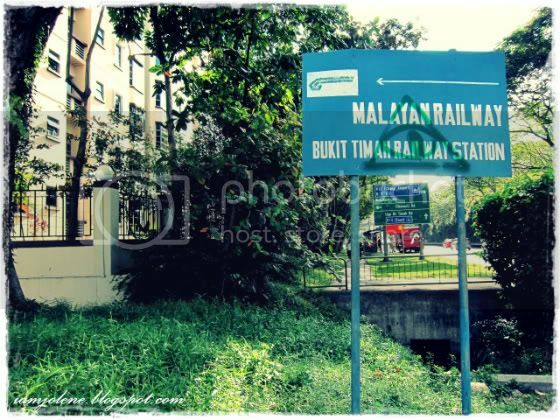 In the month of May last year, evan and I took our last train ride on the KTM from the Tanjong Pagar railway station before this nostalgic piece of Singapore gets gazetted as a national monument. 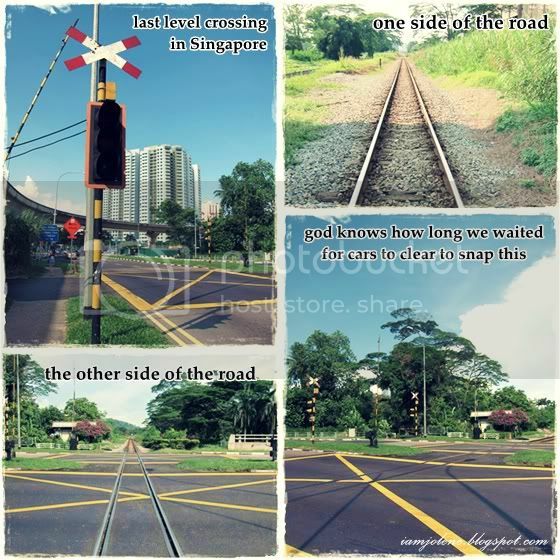 I've written a little about Singapore's railway history in this post back when we were exploring the stations and parts of the railway tracks when the trains were still in service. 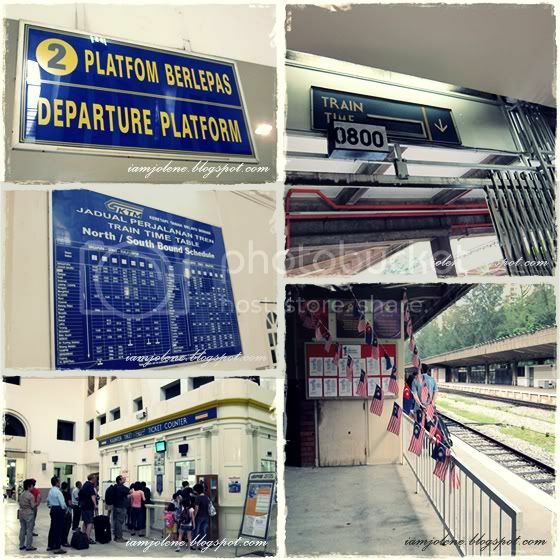 This post features our last train ride on the KTM from Singapore where we made a half-day trip to Malaysia, Johor Bahru. Even though nostalgia has to be seen and experienced and not read about, I hope my words add more colour to these pictures. accompanied by my brother-in-law's notti cat who saw me to the gate like a loyal servant, only to sit down and lick itself without looking at me once when I stopped walking. 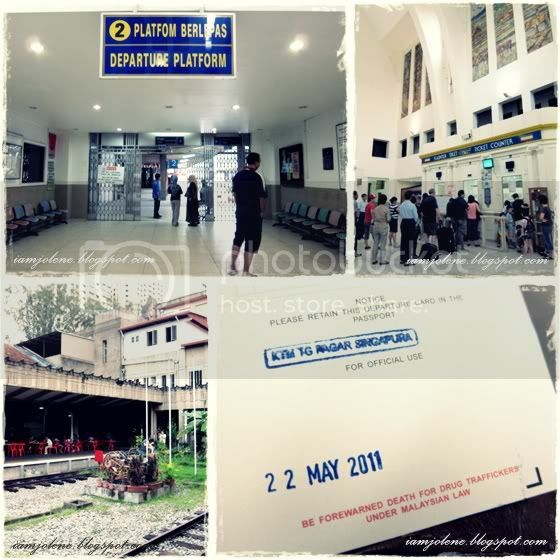 Finally evan and I reached the Tanjong Pagar Railway station and bought our tickets. The station was really crowded as everyone was scrambling to take their last train ride for the next few weekends till the station officially closed. We decided to dress up to the theme of retro in order to imbibe the "blast from the past" nostalgia. 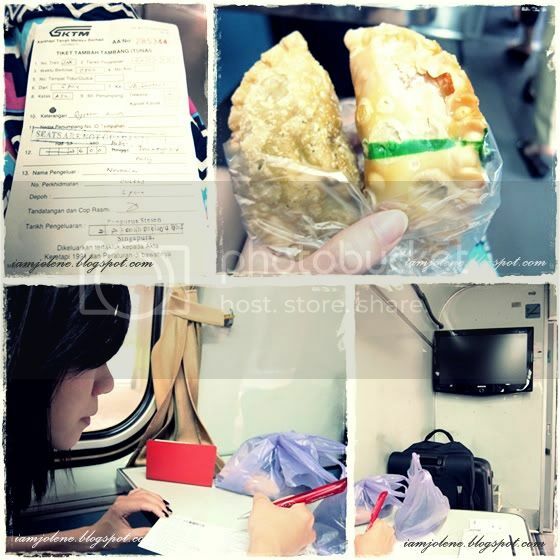 To curb our hunger, we bought ourselves curry puffs to munch on the train. Taking in all the sights in and outside the train, I had wanted to snap a picture of my old school but it went by in a flash before I could say snap. 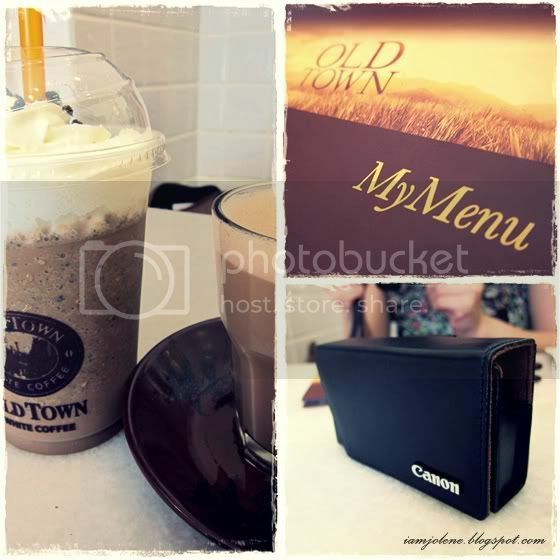 We finally reached JB and since most of the shops were closed, we headed to Old Town for some caffeine fix. We walked and shopped around when the shops started to open. 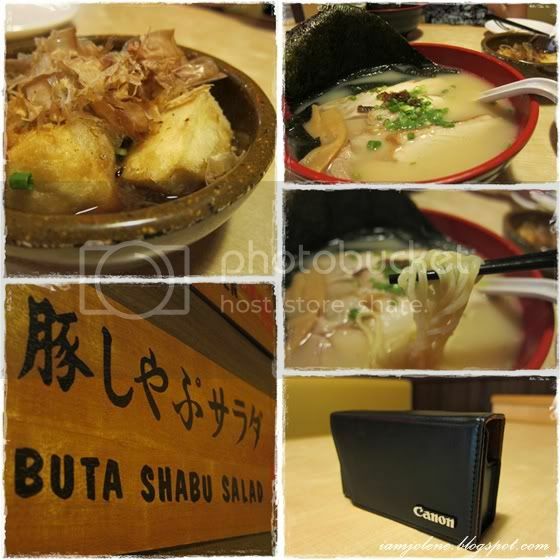 We wandered around till it was time for lunch and decided to have ramen at this place. It was a huge mistake as the ramen was bland and tasted like instant noodles. No in fact, I love instant noodles way better than this. The toufu was fine. Evan got an S95 after seeing how good mine was so there we were toying with our pretty new s95 back then. After that, we shopped again. 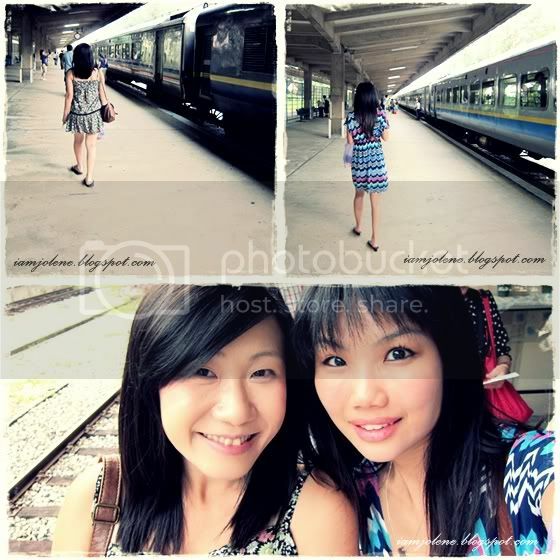 We initially planned to walk about till we could catch the evening train back to Singapore. However, the mall was a pretty boring place and so we took a bus home in the afternoon. 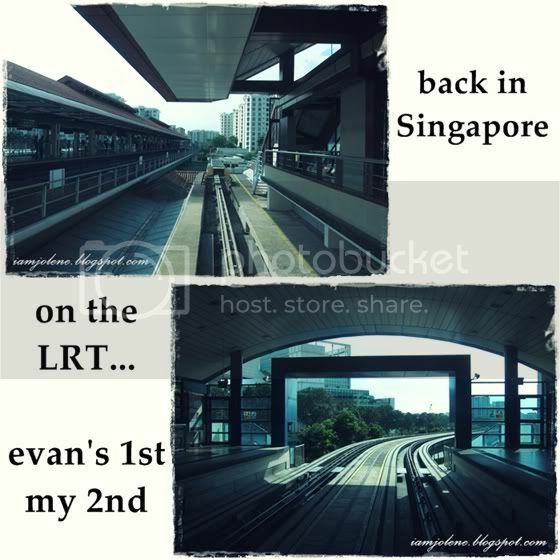 evan had never been to this side of Singapore and got so excited snapping the scenes at Marsiling MRT station. 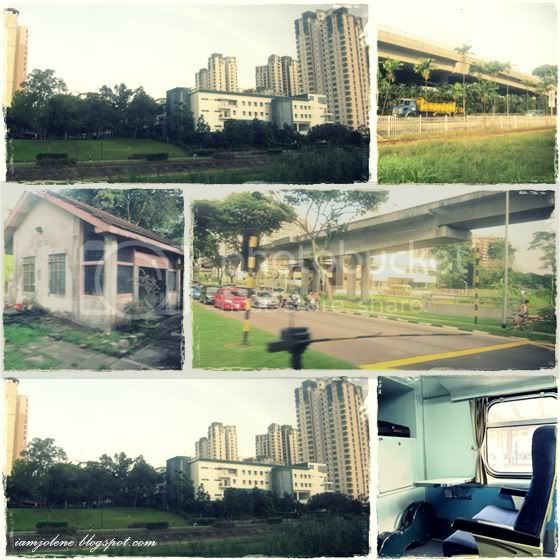 She was also thrilled taking the LRT from Choa Chu Kang and was amazed at the automatic blurring of windows as the LRT passed by the HDB flats. We decided to check out the last level crossing and also talk to the attendant there. 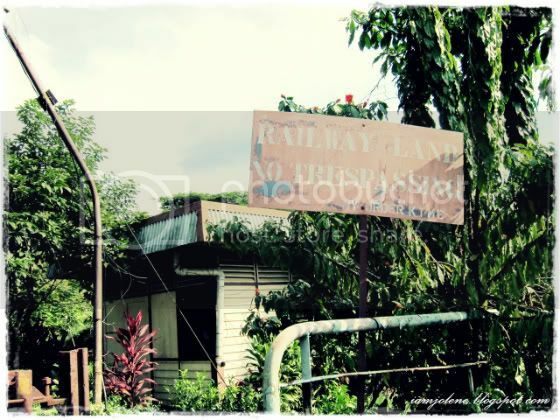 Alas the person in the hut at the level crossing was engaged in a conversation with a photo enthusiast. We stood by a little while to listen and join in the conversation when appropriate. 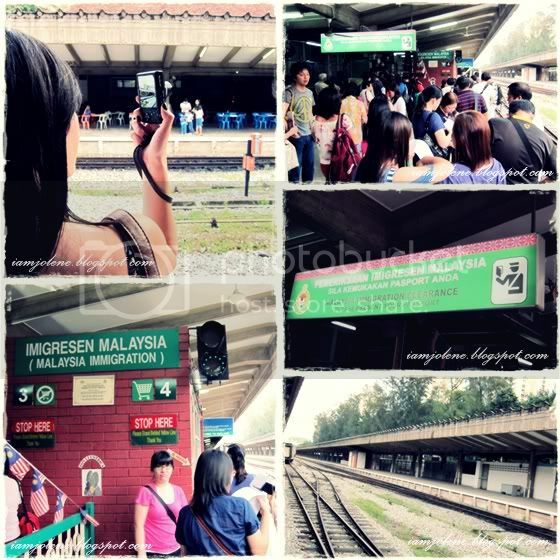 We were told by the photo enthusiast who translated a part of their conversation in Malay to us that it was best not to post any pictures of the hut till the trains discontinued service as he did not want any trouble with any authorities. In my mind I thought: "That's great. 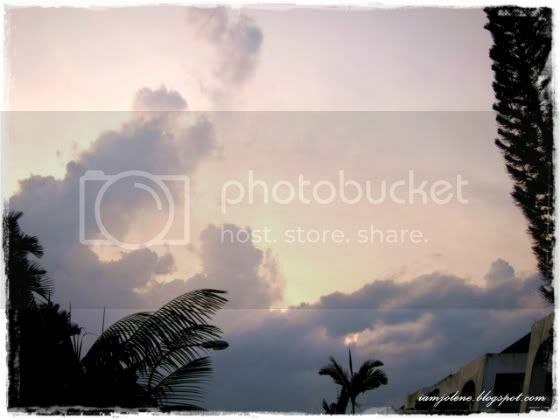 My blog posts are always backdated anyway." 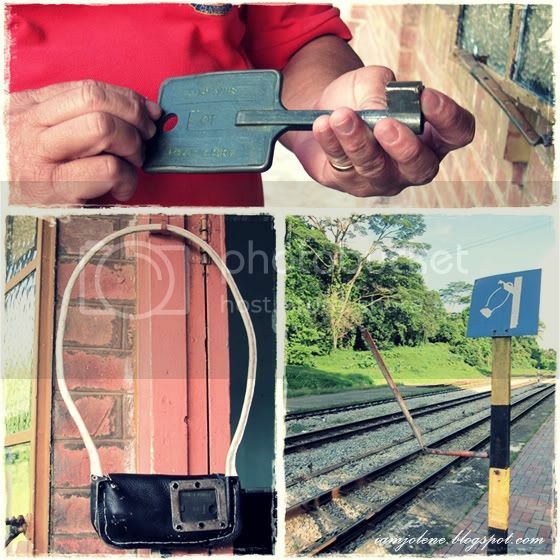 After some exchanges with the friendly attendant and photo enthusiast, we decided to head to Bukit Timah Station to watch the handing over of key token. 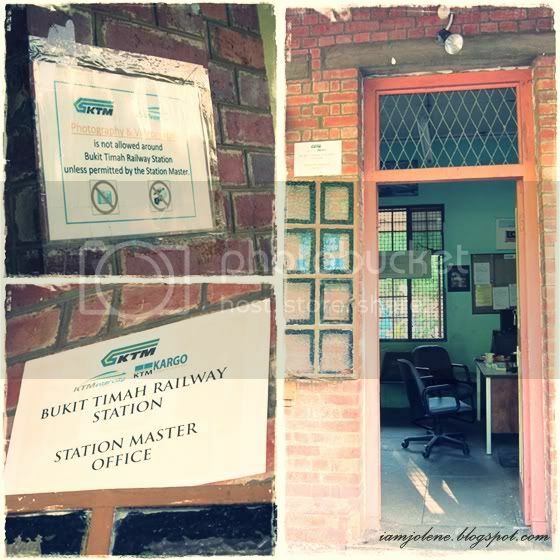 Many people thronged the quaint little station, awaiting the crucial moment of handing the key. The huge key was put into the pouch to be handed over to the train master while the train passed. I positioned myself for a few minutes at a great spot to snap the passing of key and smirked to myself for having found such a good spot. However as soon as the train roared and rumbled past the station, the girl you see on the right side of every picture below, stepped to her left in limbo, blocked my view and I missed capturing the crucial shot where the train driver whipped the key off the station master's hand. 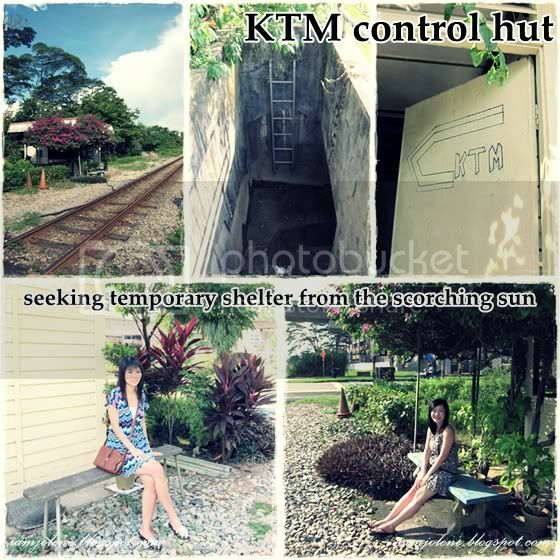 I looked at her DLSR and surrendered. 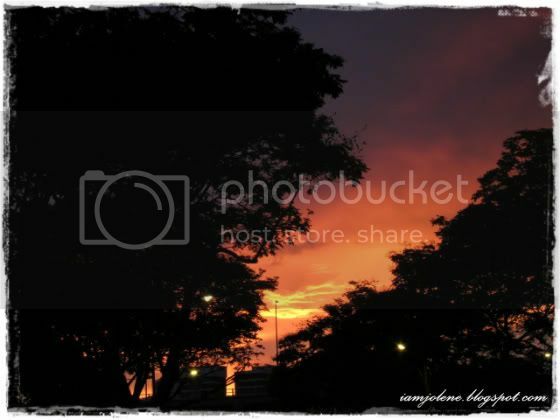 The photo of the fiery sunset below has not been edited. It was the camera angle. It was actually a lot brighter when we made our way for some gratifying local mee pok noodles. 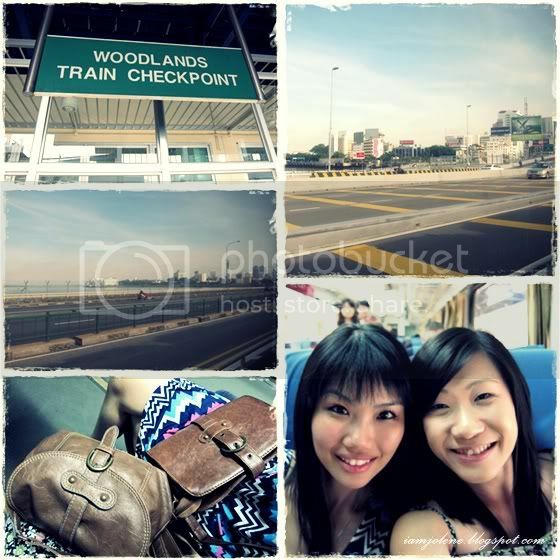 After that we caught a double-decker bus back to an MRT station. It was the first time I took a double decker bus in years. It was quite an experience and evan and I were only glad to have caught our very last train ride on the KTM as adults. Let's just hope that with this heritage gone, the future generation would still know what trains are instead of terming our MRT as trains. Happy new year to all of you! 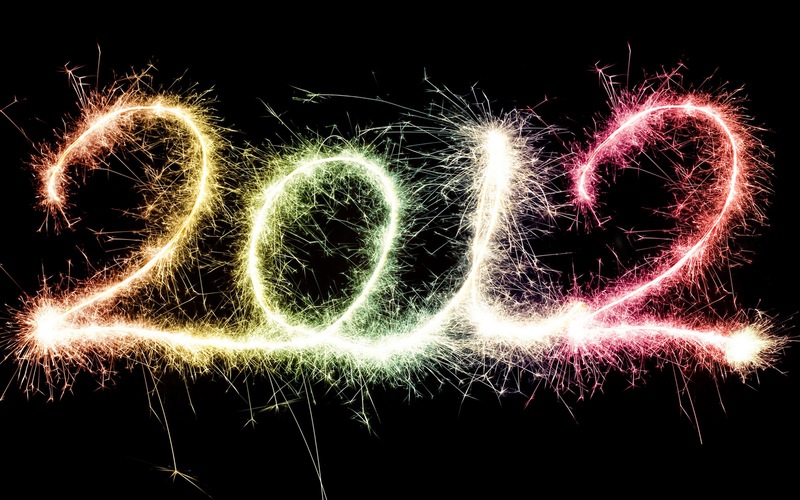 May you live, love and laugh your way through 2012! my way like what I always tell myself to do. Life isn't worth moping the minute details. I cried a lot too but I cried and picked myself up as quickly as I could. 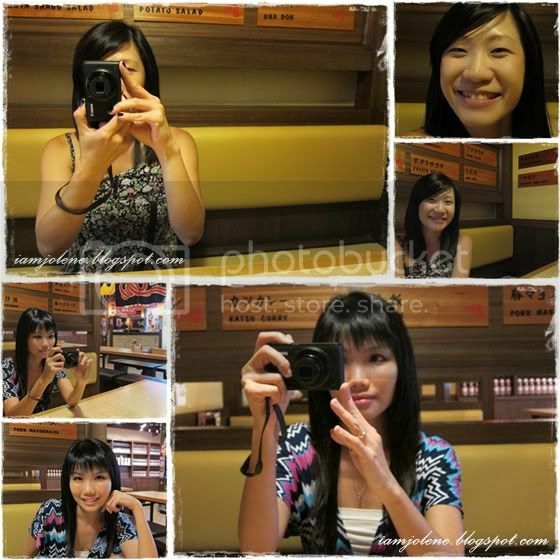 I had wanted to do a 2011 reflection post but I guess that I can hardly even keep up with the pace of my life and blogging that I'm currently only backdating May 2011 posts. My trip and my illness had put my other project on hold too and besides trying to catch up with my posts, I have to focus on that as well. It's 6.29am now and I'm back in London once more. The reason why I'm not sleeping yet is due to the fact that my hair is wet. No actually more importantly, we have to pay for internet usage in this hotel at 15pounds for a 24-hour continuous connection. I've been uploading videos after videos on Youtube and Facebook to make sure I get our money's worth of internet usage. I'm glad for the change in temperature. It's much warmer than the first leg of our trip at more than 10 degree Celsius here. My cold and cough seem to have gotten worse though but I'm glad that at least my body doesn't have to brave the cold outdoors. I just hope it doesn't rain too much. It's such a bummer to rain coz it makes me wanna nestle myself up indoors in bed with my pinkie pink laptop coz I believe in pink. After we reached London from Paris, we had high tea at Harrods. At close to 7pm, we tried our luck at Apollo Victoria Theatre and snagged 2 last minute dress circle seats for Wicked at less than half the price! We were like 2 happy larks after getting the tickets. I have been wanting to catch that musical in ages and last night was the only night left that we could catch it since it is no-show Sunday and we would be leaving London early Monday morning. Wicked was wickedly GOOD! Even the hubby who didn't know what I was hyping about found it really wicked. After the show, we decided to head back to the hotel to deposit our bags and to imbue in the new year's mood by travelling light only with our coats and everything else in the pockets. At the eleventh hour (in all essence of that phrase), we left our hotel at 11.45pm to try to catch the new year's revelry in a foreign land. The atmosphere was already built up right from the tube. Once the tube reached Leicester Square Station, it was about 4 minutes to midnight. Everyone screamed in unison, ran out of the doors and dashed all the way to goodness know where at Leicester Square (we merely followed) to view the fireworks from a little slit in between 2 buildings. I kept smiling to myself and laughing to kh while half running and half brisk walking. I've stopped going out into the crowd for NYE since many years ago and always prefer a quiet turn of the year. 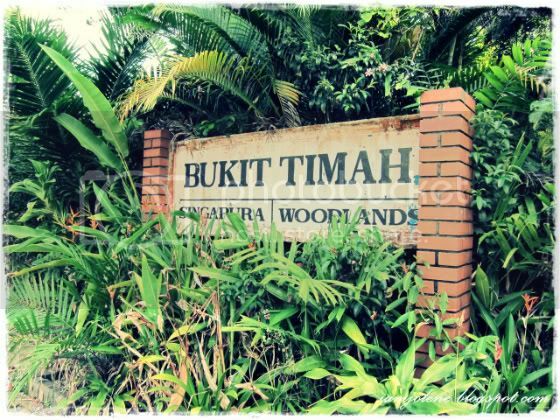 This time, it felt really good to imbibe the whole atmosphere into every pore of mine. I love the people here! I love their spontaneity a lot. I love it that we're here in London over the turn of 2011 to 2012 though I must say that kh and I both miss home a lot. Here's part if the fireworks display we saw from where we were. Not too bad for a last minute rush down. And here's a shout out from the hubby and me from the merry streets of London.